The Plot Twist, the Italian / Hungarian pop-up, is organising a second Italian craft beer event in Shoreditch, featuring the Elav brewery from Bergamo, North Italy. It's happening on Saturday 5th March, from 3pm-11pm. Go to try beers, and also to eat on the Plot Twist's 'Aperitivo' selection of Italian nand Hungarian snacks, gfeaturing cold meats and more. "Following their remarkable first appearance in Shoreditch, the mighty Plot Twist is back again! 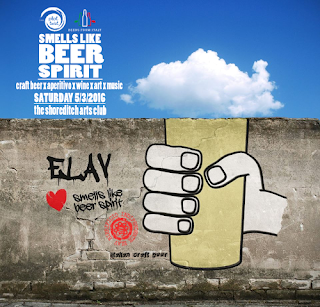 This time the Hungarian-Italian pop-up bar teamed up with importer Beers from Italy and their award-winning Elav Brewery to celebrate quality Italian craft beers at the Smells Like Beer Spirit pop-up on Saturday, 5 March at The Shoreditch Arts Club. UK based beer importer and distributor, Beers from Italy, will showcase 6 of their very best Elav craft beers from Bergamo, North Italy. Beer sommelier and writer Jacopo Mazzeo will help you discover the unique world of Elav beers throughout the free tasting session happening all day. Alongside great Italian craft beers, The Plot Twist will make sure that no one attending leaves the place hungry – the classic Italian aperitivo with a Hungarian twist is really why The Plot Twist is justly famous. Expect a new menu featuring some old classics like Hungarian winter salami with balsamic vinegar, craft sausage from Budapest with goulash cream (hot and mild), Salame Toscano with pickles and much more. Simply buy a wristband once for (£2.40) with your drink at the bar and then enjoy a selection of unlimited food to eat as you drink. As always, The Plot Twist will feature delicious drinks, art and music. Quality Hungarian wines will accompany Italian classics on the drinks list, alongside bottled Elav beers and spirits from both countries. A photo exhibition by Marta Demartini and DJ Set by Mazuro will guarantee an unforgettable event."